In a previous entry, "The New Google Toolbar Allows You to Share, Shorten, and Sidewiki" , I talked about some of the cool things you can do with Google's latest enhancement. Today, I would like to continue the discussion and look specifically at Sidewiki. To my knowledge, Sidewiki has been out since the summer of 2009. Few of my friends seem to be using it at this time, but I hope to change that. That is a very good question. In fact, it is one that I pondered on since I was made aware of the feature. Initially, I thought of Sidewiki as merely a commenting tool for page visitors. 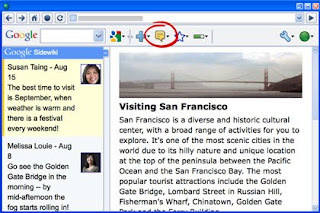 With the Google Toolbar installed, users would be able to visit and leave notes on just about any web page. For web site owners, reading the thoughts and suggestions of Sidewiki entries would empower them to make changes for the better. Additionally, owners have an opportunity to leave instructions, tips, and ideas on how to interact with the site. The more I played with Sidewiki, the more inquisitive I became. What is the real use of such a tool? Why would anyone care enough to annotate on web sites? The answer came once I realized that any Sidewiki posts also show up on my Google Profile. I asked myself, "Do I really want a bunch of simple comments and half-written instructions on my profile?" The answer was, "No!" Whatever I post in Sidewiki must be substantial enough to share on my profile as well as earn votes for helping others. Later, I discovered that Google Sidewiki has the capability to also post an entry to Blogger. This is really an added bonus, because I can hit two birds with one stone. Essentially, I can write a blog from a Sidewiki entry. What would happen if I wrote the blog first and then posted it to Sidewiki? It was at that moment that it clicked for me. As a blogger, I am already writing entries about products, people, and events. Instead of writing an entry in Sidewiki first, how about writing in my blog and then copying it into Sidewiki? After a few trial runs, I found that it is a perfect solution for getting additional page views on my blog entries. I already composed an entry about the Google Toolbar, so I copied my blog and posted a new Sidewiki entry on the Google Toolbar page. I also wrote and posted another blog entry about Seth Godin' "What Matters Now" project and posted it as a new Sidewiki on Seth's front page. Now, anytime someone visits SethGodin.typepad.com or Google Toolbar, you can see my blog/entry. To make the Sidewiki entry more useful, I included links to my RSS feed, Facebook, Twitter, LinkedIn, Friendfeed, and Google Reader pages in the footer. There are some additional things to know about Sidewiki. There is a limit on the amount of characters used within a Sidewiki entry. I estimate the limit to be somewhere around 2,660 characters (450 words). HTML is acceptable, however images are not. You can always go back and edit, delete, and share an entry. Helpful Sidewiki entries will raise to the top while less helpful ones fall down the list, so consider writing something that people will find useful. Consider posting old blogs as Sidewiki's to extend its life and get more hits. In the comment section below, let's talk about other useful ideas for the Google Sidewiki. What kinds of entries are most helpful for you?